This burrito was kind of an accident. I’m slightly obsessed with the Sweet Potato Burrito at Everybody’s Brewing, so last week, when Joy the Baker posted THIS, and I found myself with a vat of leftover butternut squash, something wonderful happened. Wonderfulness in the form of a big burrito. For the record, I love the flavorful punch of the sweet potato, and will be making that version very soon. But this little prize wins the “Best-Use-of-Leftovers-Award”. Confession: this is typically a vegetarian burrito, however, I also had leftover bacon (see where this is going? ), so I chopped that up and put it to good use as well. Mmm mmm. 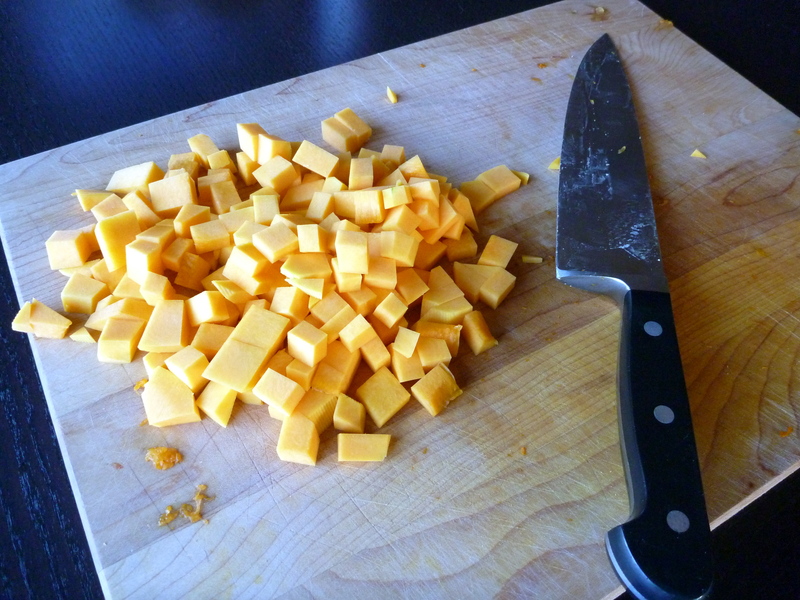 Forget P90X, peeling and dicing squash is the best arm workout ever. The importance of a good veggie peeler can not be overstated here: peel the skin until you are left only with the bright orange flesh of the squash. Then, using a large knife and a soft mallet (I’m not kidding, I get it out of the tool kit in the garage), cut through the center of the squash, tapping the knife through with the mallet. Remove the seeds and cut into 1 inch cubes (I actually like mine a bit smaller than 1 inch). 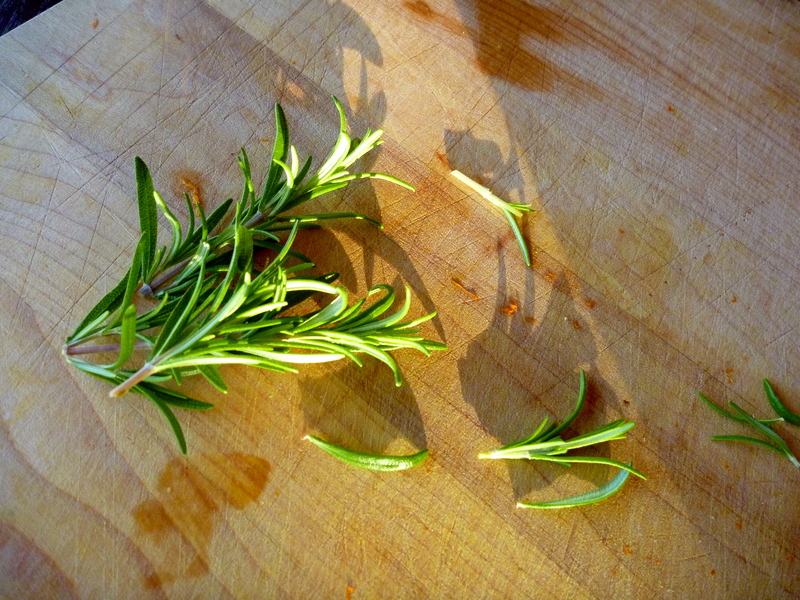 Originally, I used this for my Fall Squash Salad, so I whisked together equal parts brown sugar to olive oil (about 2 Tablespoons of each), then seasoned with fresh rosemary, salt, and pepper. I realize that rosemary doesn’t fit with the burrito theme, but it was a nice little trick-or-treat. 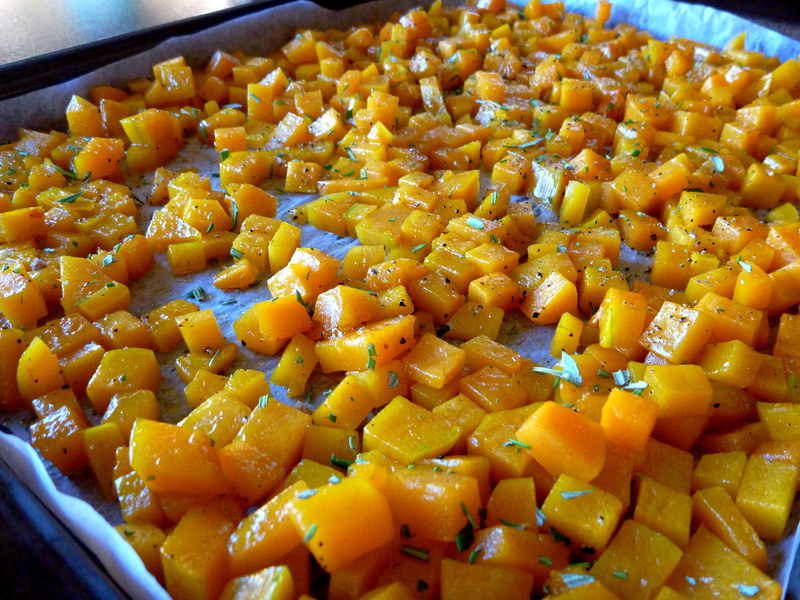 Line a cookie sheet with parchment paper, and spread the squash in a thin, even layer. Roast at 450 degrees for about 30 minutes, stirring the squash half way through. When it comes out of the oven, season with more salt, pepper, and brown sugar to taste. I use my Cuisinart Hand Mixer for this, but you could use a blender or food processor also. Blend together 3/4 cup sour cream, 1 large chipotle pepper (seeds removed) plus 1 teaspoon of the adobo sauce, juice from half of a lime, 1 clove of garlic crushed (optional), and salt & pepper, until smooth. Taste and adjust to your preference. Cilantro Lime Rice recipe found HERE. 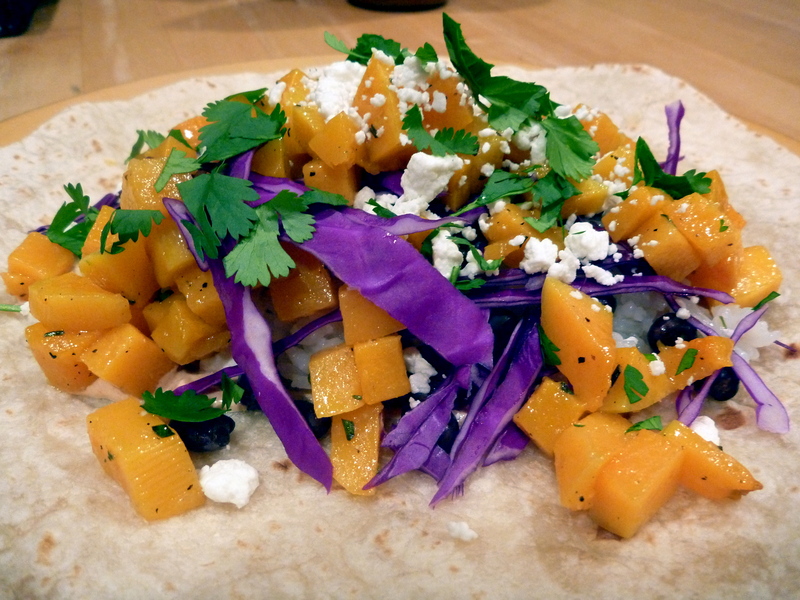 This recipe is great inside the burrito and also as a side dish. I make it often! 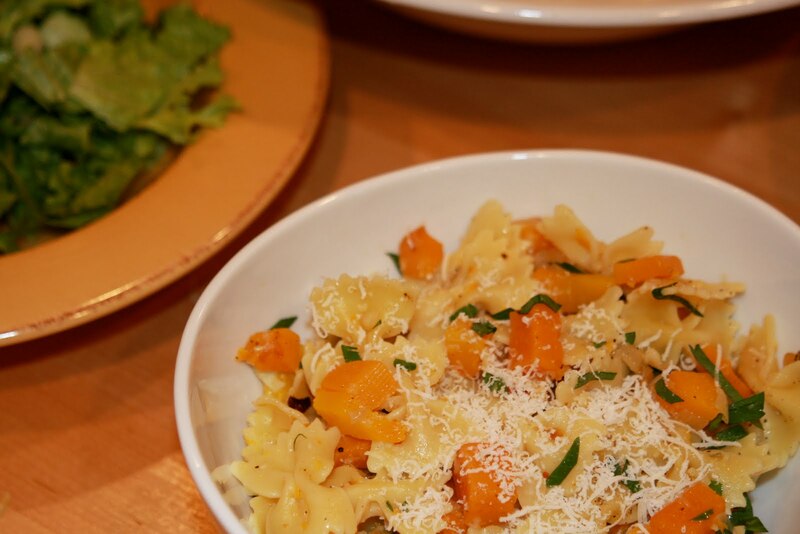 Layer the ingredients to your preference and chow down! Add as many condiments as you like: avocado, fresh salsa, (uhhh…bacon?) etc. 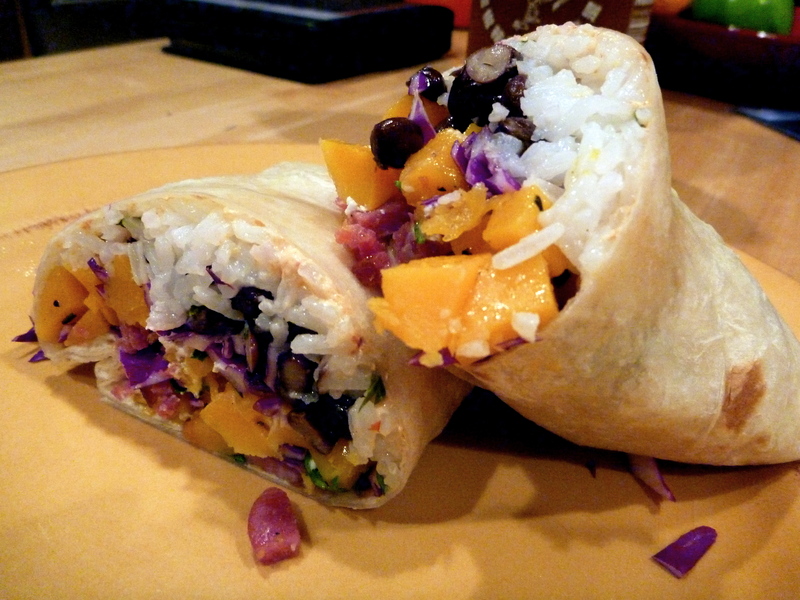 It is the most colorful burrito that you’ll ever shove in your boca. Buen provecho!